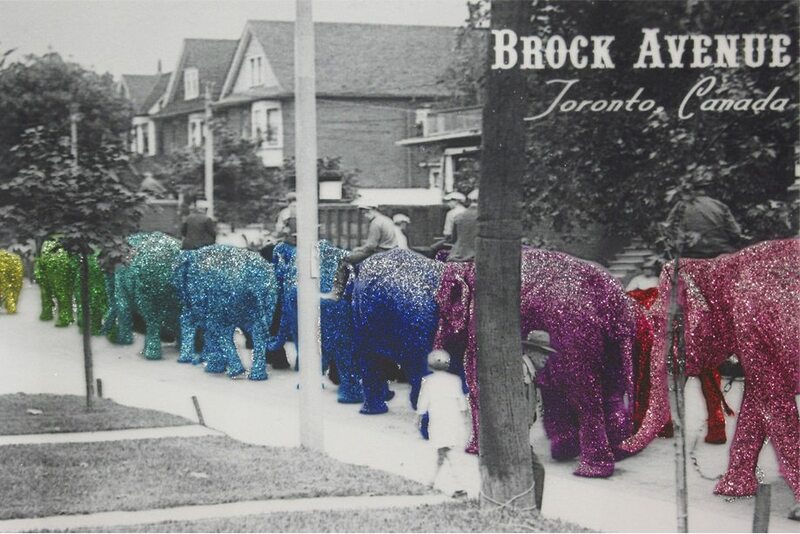 The inspiration and central image of this window installation is an archival (c. 1920) photo of a parade of circus elephants being led down Brock Avenue to the Dufferin Park Racktrack, now the site of Dufferin Mall. Created by Trixie and Beever/BBJ, the window features a large version of the photo, reimagined with the elephants in multicoloured glitter. Small art plaques with variations of this image and a 3D parade of glittering toy elephants are also parts of the installation. TOWN is located at Brock Avenue and Bloor Street West, steps from where the photo was taken.